Twin Cities Jazz Festival director Steve Heckler was euphoric when talking about the success of last weekend’s event in St. Paul. Great crowds, cooperative weather and stellar music should guarantee the event for 2010. And with the jazz lineup for the coming week, there’s really no reason to lament the elimination of the traditional second weekend in Minneapolis. Want vocal music? Bruce Henry returns again to the Dakota Friday and Saturday nights (June 26-27), and on Friday he features special guest Debbie Duncan. In other words, two of the region’s biggest voices share the stage. 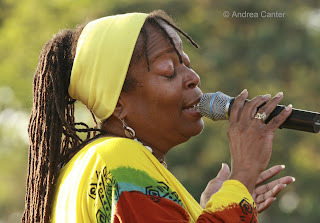 I just heard Debbie at the jazz festival’s Bloomington extension Wednesday night. She manages equal parts ecstasy and blasphemy. And I miss Bruce Henry’s magic. Fortunately he misses the Twin Cities as much as we miss him. Want over-the-edge modern sounds? Happy Apple returns to the Artists Quarter for three nights (June 26-28) of biting improvisation thanks to Mike Lewis, Erik Fratzke and Dave King. Even folks in the Big Apple were impressed when the trio gigged at Joe’s Pub last year. Expect standing room only. Or maybe you prefer a little hip-hop with your post bop? 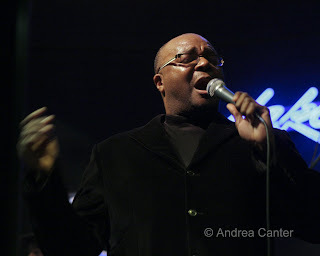 Check out the Karreim Riggins Experience at the Dakota Sunday night. The Detroit native is an alum of Betty Carter’s famed Jazz Ahead program, and has performed with the likes of Hank Jones, Ray Brown, Oscar Peterson, Milt Jackson, Donald Byrd, Cedar Walton, Bobby Hutcherson, Ron Carter, Gary Bartz and Diana Krall. Equally accomplished as a hip-hop artist as jazzman, 34-year-old Riggins brings his new project to the Dakota, opening with a drum showcase with DJ Dummy and closing with his quintet, featuring the highly acclaimed piano master, Mulgrew Miller. This night will indeed be an Experience! Bassist Chris Bates figures into some of the most creative ensembles in town, and he pops up twice at the Turf Club/Clown Lounge this week—with Volcano Insurance Monday night (June 29th) in the Clown (with guitarist/laptopper Luke Polipnik and drummer Joey van Phillips) and then Wednesday (July 1st) in the main Turf Club with Charlie Devanna—not a who, but a globally basted band led by guitarist Park Evans, along with Scott Fultz and Pete Hennig. And maybe the granddaddy show of the summer, cross-culturally minded saxman Charles Lloyd brings his “New Quartet” to the Dakota on Thursday (July 2nd). Lloyd was an early cohort of Keith Jarrett and Jack DeJohnette, later a musical partner of the late Billy Higgins, and more recently a collaborator with tabla star Zakir Hussein. Everything he touches seems to resonate across time and continents. Now he’s working again in a quartet context featuring firestorming pianist Jason Moran, eclectic bassist Reuben Rogers, and drummer Eric Harland, with whom Lloyd has previously toured in tribute to Higgins as well as with Hussein and Harland in an unusual percussion trio. Coming soon? The Iowa City Jazz Festival over the holiday weekend offers the most high level jazz in the tightest time frame, all free, with Chris Potter’s Underground, the Bill Frisell Quartet and the Dave Holland Quintet playing back to back to back Sunday night (July 5th). David Sanchez hits the stage as the festival opener Friday night, and Saturday features Trombone Shorty followed by West African guitar sensation Lionel Loueke. From the Twin Cities, this is an easy 5-hour drive. 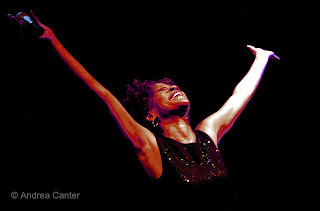 (See http://www.jazzpolice.com/ or http://www.iowacityjazzfestival.com/ for details.) 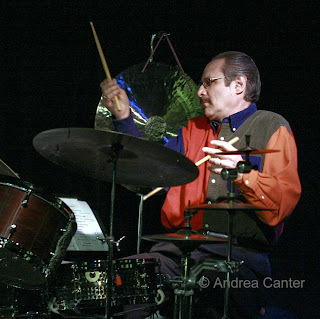 In the next week, mark your calendars for Bill Carrothers and his European Trio on July 9th at the Artists Quarter, warming up for a week at the Village Vanguard. We used to call it the Hot Summer Jazz Festival. Then, perhaps to call attention to the location, it became the Twin Cities Jazz Festival. But last fall, it almost became another casualty of economic downturns, as Festival Director Steve Heckler was on the brink of announcing that the area's biggest jazz event of the year would be canceled for lack of sponsors. In recent years, the TC Jazz Festival covered two long weekends on either side of the Mississippi, centered on Mears Park in St. Paul and on Peavy Plaza in Minneapolis. But sponsors like Mercedes Benz, Caribou Coffee and Summit Brewing gradually dropped out. And where was the city of Minneapolis? Jazz apparently just wasn’t a big enough draw despite the 25,000 or so who typically crowded both venues each June. But in winter 2009, with the annual Winter Jazz Festival scratched for similar lack of support, a funny thing happened. The city of St. Paul, specifically the office of Mayor Chris Coleman, decided a jazz festival was important to the community. 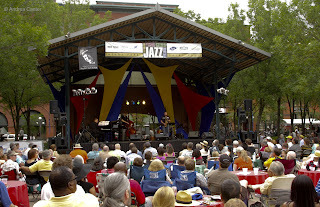 They found sponsors, the city offered support, and Mears Park was soon designated as the epicenter of the 2009 Twin Cities Jazz Festival, scaled back to one weekend, in one city. Steve Heckler jumped on the opportunity to make this a festival of quality if not quantity. So who needs Minneapolis or Peavy Plaza? With only a thirty-minute shower neatly falling between Friday night’s last sets, even the weather seemed to bless the festival. 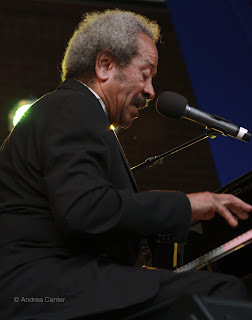 There was already a good crowd when the young Turks of the Dakota Combo opened on Friday afternoon, and by the time Irv Williams took his final bows, there literally was not even standing room at Mears Park to welcome Allen Toussaint to the stage. 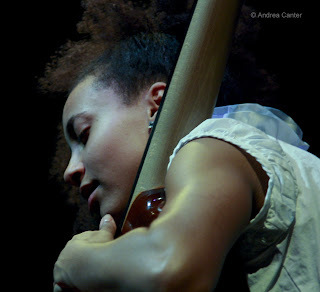 Much the same pattern emerged on Saturday, with more and more gathering for each set until, again, folks stood five rows deep to holler and whistle at Esperanza Spalding, whose talent outshines her near cult status. Legend and fast-rising star sparked equal interest. I can’t estimate the size of a crowd larger than a fully loaded elevator. But if the quality of music, enthusiasm and lack of elbow room are any indication, the 2009 Twin Cities Jazz Festival of St. Paul was as successful as any I’ve attended. Irv Williams, the New Standards, Terence Hughes, the Klondike Kates, Jon Weber, Allen Toussaint and the Southside Aces are all well established with their own large followings. The Dakota Combo, Walker West ensembles, Esperanza Spalding, and the weekend's upstager of them all, 21-year-old saxman Alex Han, injected the youthful spirit that any festival needs to keep the energy (and beer) flowing and sponsors happy. Give Steve Heckler, and Chris Coleman, a high five and grand cadenza! 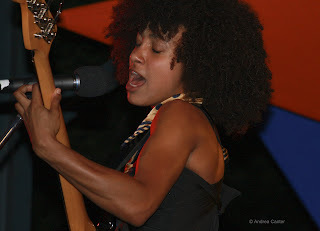 Photos: (top to bottom) Carson King-Fournier and the Dakota Combo opened the Mears Park stage on Friday afternoon; the crowd packed the space in front of the stage at Mears Park for Jon Weber and Alex Han; Allen Toussaint headlined Friday night; Esperanza Spalding was the best night cap on Saturday night. 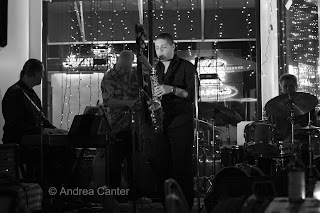 Photos by Andrea Canter at the 2009 TC Jazz Festival. The Twin Cities Jazz Festival might be scaled down but is hardly lesser event. Rather, it’s a more compact affair, geographically and temporally, concentrated now in St. Paul’s Lower town and covering one weekend rather than two. But it is true that good things come in small packages. The festival launched earlier this week with the opening of Visual Jazz at the Grand Hand Gallery, in conjunction with Jazz88 Radio’s “Gallery Grooves.” Over 30 artists are represented, and each painting, photo, sculpture, etc. says something about jazz—directly or metaphorically. The exhibit is open through July 8th. The annual Jazz Night Out seemed successful based on the venues I visited. There were good crowds at Camp Bar for the Jazz Vocalists of Minnesota Showcase, at Great Waters Brewing Company for guitarist John Penny, and at the Hat Trick Lounge for the Jon Weber/Alex Han Quartet. Opening day was a combination of youth and legend, with the Dakota Combo making one of their last public appearances to kick off music at Mears Park, followed by the Brazilian sounds of Terence Hughes and Phill Fest, Irv Williams getting his upcoming 90th birthday celebration underway, and closing with New Orleans giant Allen Toussaint. This weekend offers additional opportunities to enjoy Weber and Han. It’s a pairing of pianist/prodigy fully matured (Weber) and altoist/prodigy maturing into adult artist (Han). 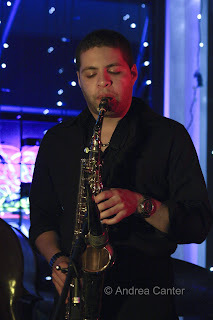 Both have become popular performers at the TCJF, Weber often in the role of “house pianist” as well as leader of his own quartet, Han now enjoying his third appearance in about five years and, at 21, still enrolled in college at Berklee. At Hat Trick on Thursday and at the Artists Quarter on Friday night, they were buoyed by the rhythm section’s dynamic duo of Gordy Johnson and Phil Hey. Hey returns with them at the AQ Saturday, another bassist will be on stage as Johnson has another commitment. Han brought down the house with his spiraling insistence on “Naima” and songful “I’ll Remember April” in the first set at the AQ. Expect crowds at both Mears Park and the AQ, and expect to be blown away. Friday night’s festival crowd weathered one downpour between sets and overflowed Mears Park by the time New Orleans pianist/vocalist Allen Toussaint came on stage to receive a city of St. Paul proclamation (naming the day “Allen Toussaintpaul Day”); more marvelous music is scheduled for the second full festival day (6/20) – the young energy of a Walker West ensemble, the edgy sophistication of The New Standards Trio, Weber and Han, and yet another prodigy turned pro, bassist/vocalist Esperanza Spalding. She performed to an SRO crowd at the Dakota in March so best plan to arrive at Mears Park early in the afternoon to guarantee sitting. Plan to spend the day (from noon til dark)—the concessions include some great tacos and other treats this year. The festival ends Saturday but more giants of modern jazz keep the spirit alive in the coming week. 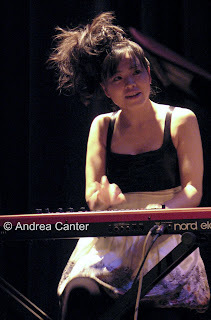 Japanese pianist Hiromi and her Sonicbloom Quartet return to the Dakota (June 21-22). We first saw Hiromi at the 2004 festival and were dazzled and dizzied by her Tatumesque speed and inventive compositions. Time has only matured her talent. 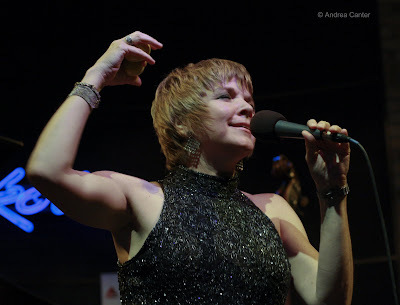 Right on her heels comes Karrin Allyson, returning to quasi home turf at the Dakota (June 23-24). A one-time area resident, Allyson has a voice like no one else, and is equally adept at English, French and Portuguese lyrics. Barely cooled off from Weber and Han, the Artists Quarter prepares for a volcanic week with the Tuesday Night Band (on Tuesday of course), the Phil Hey Quartet (6/24) and the Bryan Nichols/Adam Linz/Phil Hey Trio (6/25)—and then it’s Happy Apple coming in for three nights over the next weekend. 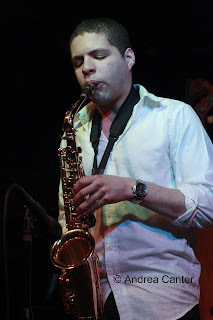 Multi-saxman Chris Thomson joins Nichols and drummer Tim Glenn at Café Maude on Saturday (6/19). There may be some tickets left for Sunday’s performance at the reopened Capri Theater, Saturday is sold out. Charmin Michelle, Debbie Duncan and Dennis Spears, with the Wolverines Trio, salute “Legends” Ella Fitzgerald, Lena Horne and Joe Williams. And now that she’s back from Spain, Charmin will again be serenading at Fireside Pizza, Mondays and Wednesdays. 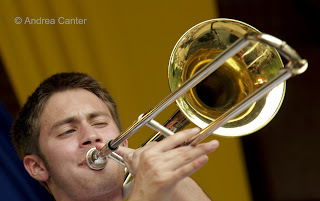 There's plenty of jazz this week, but let's start off with the Twin Cities Jazz Festival which gets into full swing at Mears Park today at 4 pm. Last night's club crawl was a preview -- particularly of 21-year-old alto sax fiend Alex Han, making his third appearance at TCJF. Last night he warmed up with virtuoso pianist Jon Weber at the Hat Trick Lounge, Gordy Johnson and Phil Hey providing the pulse. Weber and Han hold court at the Artists Quarter after the festival winds down tonight and tomorrow night (9 pm), and Alex leads the quartet tomorrow afternoon at Mears Park. Check the full festival schedule at http://www.twincitiesjazzfestival.com/. Remember tonight is Allen Toussaint headlining at Mears Park, but if you get a chance, come down early and hear the sensational teen band, The Dakota Combo at 4pm. 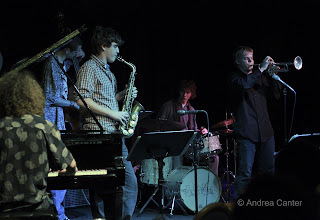 Veterans and youngsters combine for some prime jazz moments this week! Three of the most talented musicians connected to the Twin Cities are releasing their second recording, more than a decade since their debut. 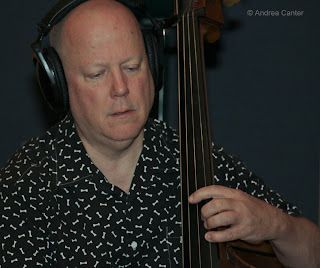 Led by incandescent drummer Jay Epstein, the trio also features international bass sensation Anthony Cox and the irrepressible pianist Bill Carrothers. Their new CD, Easy Company, is magical. They will be celebrating at the Artists Quarter on Friday and Saturday nights (6/12-13). Bobby and Ginger Commodore are also celebrating, birthdays, anniversary and more at the Dakota this weekend (6/12-13). It’s always a treat to hear Ginger sing her signature combination of jazz, blues, soul and gospel. And stick around (or come after whatever) for Late Night at the Dakota with two edgy bands on this weekend’s schedule—Charlie Devanna on Friday (6/12) – there is no one named Charlie, it’s the brainchild of guitarist Park Evans and features his frequent collaborators, Brandon Wozniak, Chris Bates and Pete Hennig; and the Chris Thomson Quartet on Saturday (6/13). Worth staying out late... and after all, jazz is a late night art! Sunday afternoon you can check out the future generation of jazz when the ensembles of Walker West Academy of Music perform at Dixie’s on Grand. When I encounter talented high school and college students in the Twin Cities, I can almost always find some connection to Walker West. 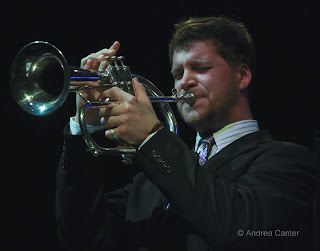 Only a few years older, trumpeter John Raymond recently completed studies at the University of Wisconsin-Eau Claire and will soon be off to a graduate program at the State University of New York – Purchase, so catch him while you can—on June 18th at the Dakota. John is already a veteran of performances at the Dakota with his own John Raymond Project as well as with Nachito Herrera. The spotlight is on a rising star among area vocalists when Christine Rosholt appears with her stellar band at the Dakota on Monday, June 15. Always trying out new material, Christine promises some tunes from Blossom Dearie and Anita O’Day. The Twin Cities Jazz Festival gets underway this week. On June 17th, you can see as well as hear jazz at the Grand Hand Gallery’s opening reception for Visual Jazz, an exhibit of visual artists working with jazz themes. 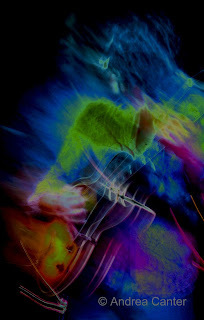 (One of my photos was accepted for the show, along with one from my friend John Whiting and works from about 30 other artists.) Irv Williams and Peter Schimke will be on hand for the live music. Then on Thursday night (6/18) is the annual Club Crawl/Jazz Night Out. Stop by any of 15 St. Paul venues for some special music, and hitch a ride on a trolley to take you from one club to another. See the festival website for the full list of options, which include the Jazz Vocalists of Minnesota showcase at Camp Bar, guitarist John Penny at Great Waters Brewing Co., The Five at the Artists Quarter, Paula Berends followed by Jon Weber & Alex Han at the Hat Trick Lounge, Tres Mundos at Senor Wong, Joann Funk at the St Paul Hotel, and Framework at Rumors and Innuendo. Coming soon—the Twin Cities Jazz Festival in full swing at Mears Park and several small clubs in the vicinity on June 19-20. Come down early for the 4 pm set by the amazing Dakota Combo on Friday—our area’s premiere student band; stay on and catch the legendary Alan Toussaint and then head to the AQ for Jon Weber and Alex Han; on Saturday enjoy the youthful sounds of Walker West, the very popular New Standards, and close out the festival with the prodigiously talented bassist/vocalist Esperenza Spalding. Music continues into the week with Hiromi (6/21-22) and Karrin Allyson (6/23-24) at the Dakota; Phil Hey (6/24) and Bryan Nichols (6/25) at the AQ. And note the announcement of the Chick Corea Trio with Stanley Clarke and Lenny White in a rare club gig at the Dakota September 7-8, tickets going on sale this week.